I did this using drush, but you can do it anyway to please. Now, with the version I was using (7.x-1.1) the timezone handling wasn’t working properly so I applied this patch to correct timezone handling. Hopefully that get’s permanently fixed in the module soon, and you won’t have to apply the patch anymore. 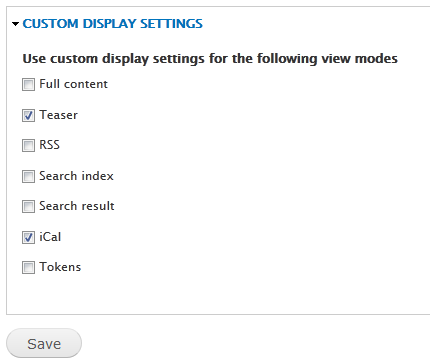 Next, we need to configure the content type that we want to use the iCal settings. 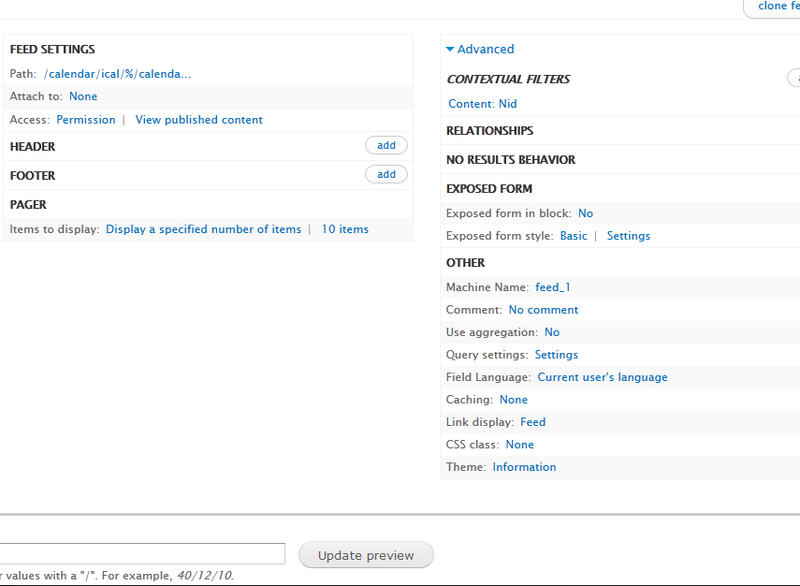 I all ready have a content type setup with a date field, called “Events”. If you don’t have one, then you’re going to have to create one. Click “Save” and then you need to choose what you want to show up in the iCal file description. Here is what mine looks like, don’t pay too much attention to this part or how mine differs from yours, I have this setup for different display settings in “Default” display. Next we are going to add the view functionality in to generate our iCal files. 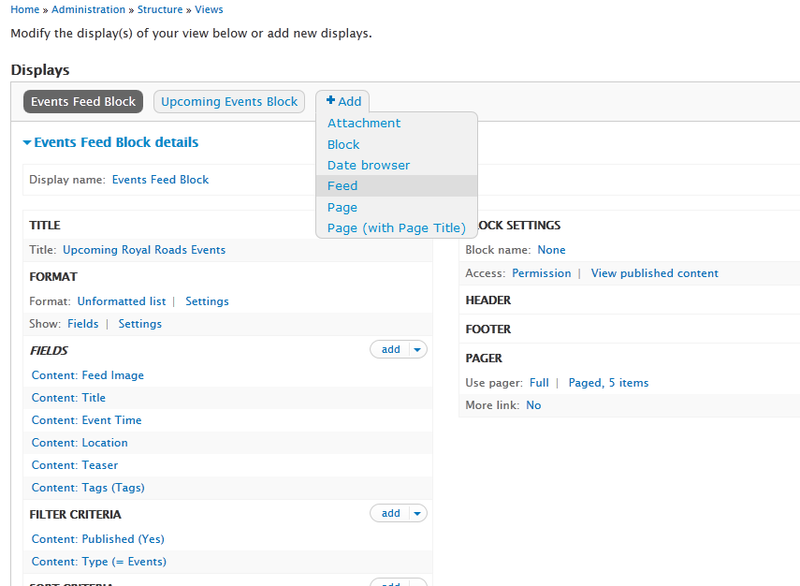 Create a new view or choose an existing one, and add a “Feeds” section. Almost there, just need a couple more settings. Press Apply and you an leave the settings black or put in what you like. Click Apply, then you need to chose the field that contains your date information. Click apply, save your view, and you are ready to get iCal files for your events. To test your iCal files, get a node ID for an event you have created and then go to the URL http://example.com/calendar/ical/%/calendar.ics except you need to replace example.com with your site, and % with the node ID (nid). You can integrate this into your theme template files with some code like this. Great post! Thanks a lot! But how can i automatically create a link to ICS file, for every node of calendar type? @Artem I mentioned a little bit about that at the bottom. Two good ways to do this, either by creating a .tpl.php file for your calendar type or creating a block with custom PHP code to display on all calendar type nodes. Then place the code like I mentioned in the block or template file where you want it to display. yes, it helped. 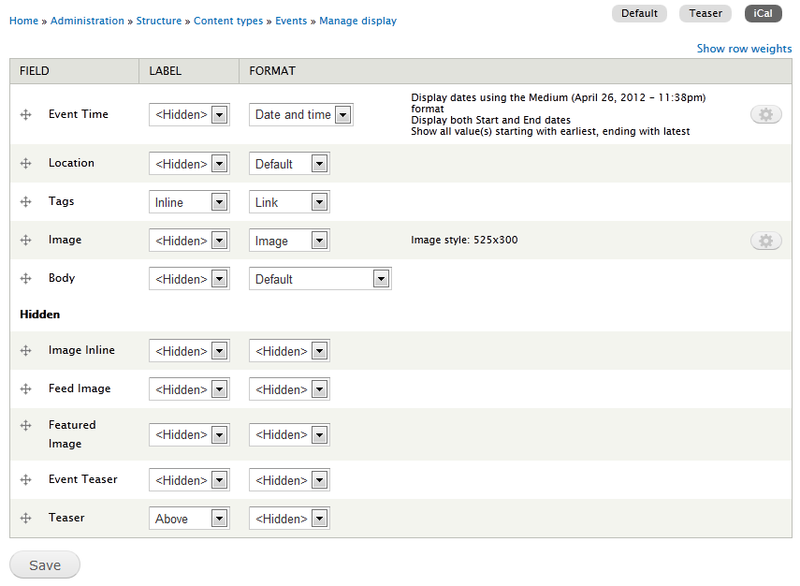 But, I was wondering, is there a way to do that, when you create a new feed view of format Date iCal? at the bottom of “Path” field, there is an “Attach to” field. Currently when I attach path “calendar/ical/%/calendar.ics”, for example, to page with content type calendar, it is displaying iCal logo in every node, even in content types blog, an so on…. @Artem I’m not sure. You are using a filter to select only the nodes you want in the view right? Basically everything is working properly, it’s just showing up on all nodes instead of just the ones you want? @Craig, with my feed, I’ve done everything as described in this post. Then I added a new page to my calendar view, Filter criteria: “Content: Type (= Calendar)”, Contextual filters: “Content: Nid”, Path: “node/%”. Then I attached my feed’s path “calendar/ical/%/calendar.ics” to this newly created page. And yes, this logo appears in all nodes, but I only need this logo to be in nodes with “Content: Type (= Calendar)”. Is it possible? or I need to construct link to my nodes as, for example, “calendar/node_alias” or “calendar/node_name” instead of “node/nid”, and then use contextual filters? Very helpful. You have described the whole process in a very simple way. I’m glad this helped you out! A million thanks. I was missing the ical entities in the show part. OY!